Coquitlam Centre is ready to grow! Starting with a 16-acre parcel in the northeast corner, and working towards the creation of a vibrant regional urban centre through a phased approach over the next 60+ years. The Phase 1 area is adjacent to Lincoln SkyTrain Station and includes the former Sears site (currently vacant), the east parking lot and two parcels on the northeast corner of the site. WHAT’S THE DIFFERENCE BETWEEN LAND USE VS. ZONING? An OCP Amendment application is a request to change the land use. Morguard is applying to change the land use designation in this area from General Commercial (which only allows commercial uses, such as the existing shopping centre) to City Centre Commercial to allow higher density mix-use development in line with the Morguard’s and the City’s aspirations for a vibrant downtown. This application requires changing the Official Community Plan (OCP). Zoning prescribes what types of buildings and specific uses are allowed in a land use area. 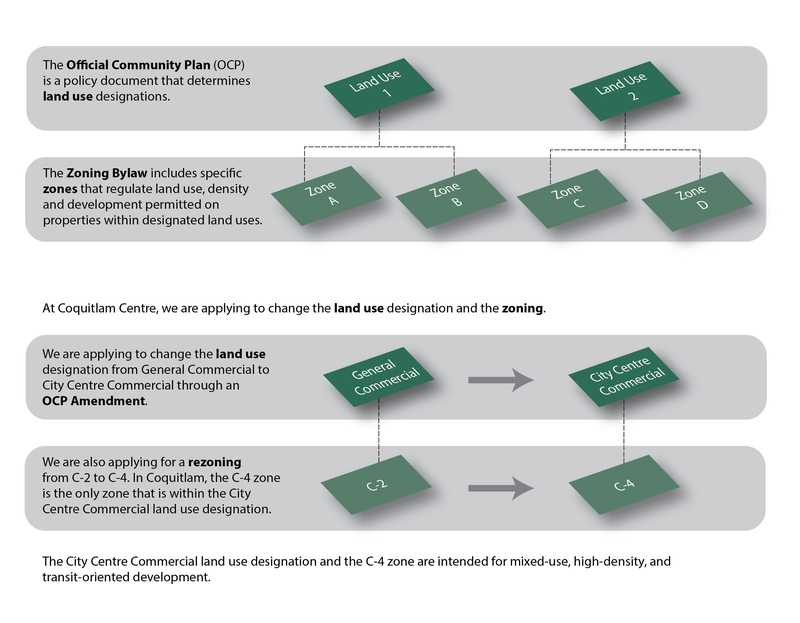 Morguard is applying to change the zoning from C-2 (General Commercial) to C-4 (City Centre Commercial) to reflect the proposed new land use designation (through the OCP Amendment application). The new C-4 zoning is the same as adjacent developments on Glen Drive and The High Street, and emphasizes a range of housing, commercial and retail uses with vibrant and active ground floor frontage throughout. 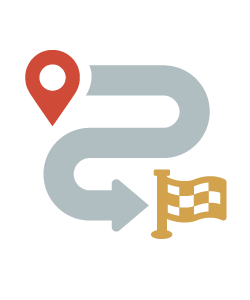 Subdivision is the process of segregating one parcel of property from another parcel. 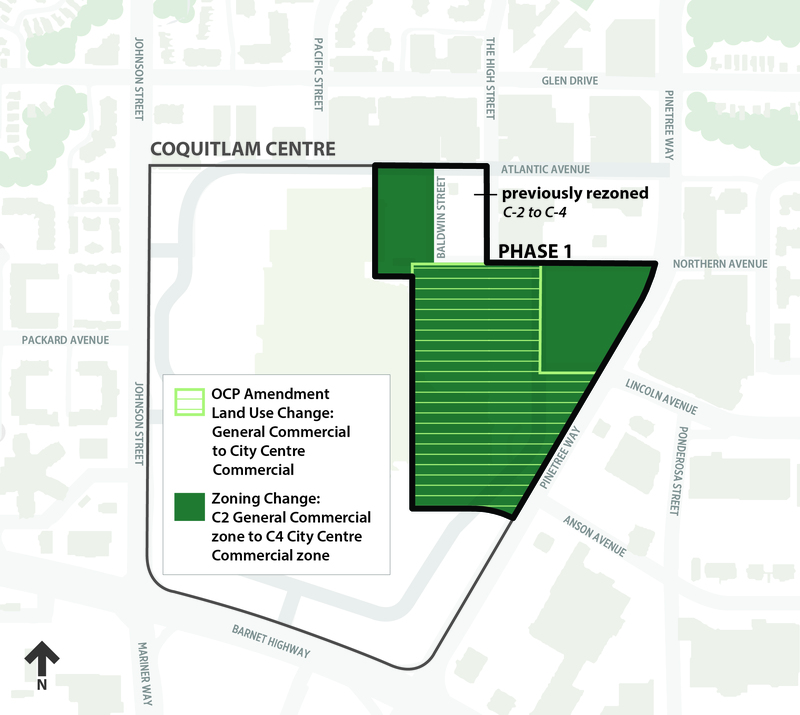 To proceed with a logical phased development over time, Morguard is looking to separate this Phase 1 area from the rest of the Coquitlam Centre site. The OCP Amendment and Rezoning applications apply to this Phase 1 area. 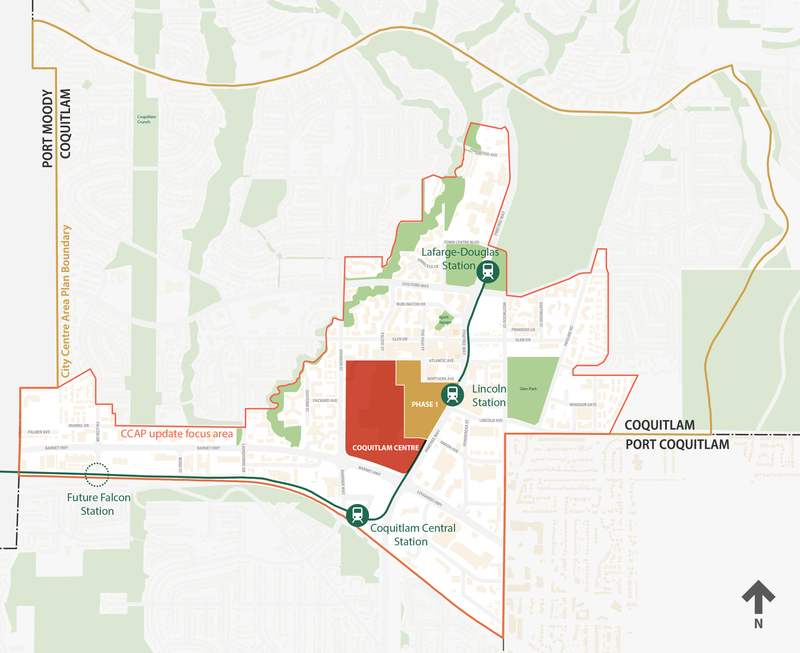 The Phase 1 process is anticipated to take 8-10 months, with an estimated approval for OCP amendment and rezoning by Coquitlam City Council in summer 2019. Development will occur on a phased basis subject to market demand. Each block within Phase 1 will include a Development Permit process, subject to City of Coquitlam Council approval before construction starts. As Phase 1 will build out based on market demand, it is not currently known when construction will be completed.